Please accept my blessings. I beg to thank you very much for your letter and I have received your presentation and the prasadam I have distributed to all the devotees. I have read the headline prayer. It is nicely written, correctly spelled, which shows that you are a very intelligent girl and you can use your talent and intelligence for serving the Lord. Young boys and girls are sometimes agitated in mind but if we follow the regulative principles and chant Hare Krishna mantra regularly the onslaught of material nature can be checked. 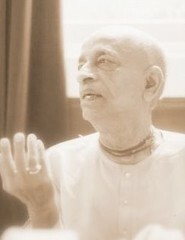 The whole process is, of this Krishna Consciousness movement, to meet the waves of material nature. The waves are called agitation by hunger and thirst, lamentation, confusion, illusion in so called love and affection, pangs of old age and disease and at last meeting with death. All these things can be changed simply by engaging ourselves in the service of the Lord which keeps us always in the transcendental position. Some way or other if we are able to keep in the transcendental position by devotional service we remain completely untouched by the contamination of matter. By the grace of Lord Caitanya things have been reduced to a very easy operation: by chanting Hare Krishna, Hare Krishna, Krishna Krishna, Hare Hare, Hare Rama, Hare Rama, Rama Rama, Hare Hare. Please offer my blessings to Mandakini and all the others. Hoping this will meet you in good health. Please accept my blessings. I beg to acknowledge receipt of your letter dated 29th September, and previous to this I had received one letter from you also. Now I may inform you that Nara Narayana has already gone to Calcutta especially for the purpose of making a model of Mayapur construction work. So immediately you can contact him. Regarding the other models like New Vrindaban, L.A., N.Y., Dallas, he can make models provided there are photographs of different buildings. So you contact him and do the needful. I am glad to know that Ksirodakasayi has gone there already to take charge of his respective duties. So do everything nicely and combinedly because we have got a heavy task before us. This Krishna Conscious movement is a revolutionary process for making the godless world drop back to their original consciousness, although it is not expected that we shall be able to turn everyone to Krishna Consciousness. But if some of the leading men only can take to this understanding, tremendous good will follow for the people in general. I am glad to know that you are contacting some of the leading men in Delhi. So deal with them very cautiously because these men are not Krishna Conscious and are very much brittle like china clay dishes. Once broken it cannot be joined together. That means spoiled. So as we handle the china clay dishes with little care, similarly try to handle them carefully and try to induce them gradually to the platform of Krishna Consciousness. You are all very intelligent boys and girls and I have full faith in you for pushing on this movement all over the world. Regarding money matters I am very glad to know that you are not using book funds and building funds any more. It is very encouraging. The bumblebee project is very nice and I am so engladdened to note your encouraging writing "I will take responsibility to make sure this centre, Mayapur Project and all of ISKCON as a whole becomes purified, and it is my wish that you are relieved of any management burdens." So please keep me informed regularly but one thing I note is that formerly I was informed that the Calcutta function will take place from 21st October, but I have received one letter from Jayapataka Maharaja in which it is said that the function will take place from 28th October. So which one is correct? I am puzzled. Let me know definitely and the different programs. Along with the other names I see Nanda Kumar. Does it mean that he has left Bombay? Then who is taking care of the Deity? And why he has left Bombay? Activities are going on here nicely. There are TV engagements and a very large meeting is scheduled at the university of Nairobi for tomorrow. Many respectful Hindus are inviting us and I am staying in everyone's house for four to five days. Most probably our center here in Nairobi will be a strong one, as strong as any of our other centers. Two black devotees have come here today from N.Y. to make propoganda and the local Africans also are becoming very much interested. Also the life membership program is going on very happily. Already we have collected more than 30,000 shillings. You can give the title for the pandal program as World Sankirtana Movement. Please offer my blessings to all the others there. Hoping this will meet you in good health. Please accept my blessings. I have seen your letter addressed to Brahmananda Maharaja complaining that Madhudvisa Maharaja in Bombay is not cooperating. The books are very urgently required here because we have made about 35 members and none of them have been supplied with any books. Every day they are asking for books and this is not very good for us. Brahmananda also showed me the copies of the correspondence with Bombay since the beginning of August and still the books are not arrived. So please do the needful. Why this is happening? I have also sent one note to Madhudvisa Maharaja in this connection. Please accept my blessings. I beg to acknowledge receipt of your letter dated 26th September, 1971 and have noted the contents carefully. So far purchasing adjacent land is concerned, that is also my opinion that if they are available at reasonable price we should purchase. So with the consultation of the lawyer and Mr. Sarkar do the needful. We have got a very heavy task before us. Together we have to push on this Krishna Consciousness movement for a revolutionary change all over the world. It is not our manufactured movement but it was ordered by Lord Sri Caitanya Mahaprabhu and we are simply carriers of his shoes. So let us do this duty carefully so that our life may be successful, although our attempts are not as great as they should have been. I am glad to learn that the jute crop is saved and I do not know why there was damage on the roof of the cottage. Also formerly I was informed that the Calcutta function would take place on the 21st October but now I learned from your letter that it will take place on the 28th instant. So I am making my program of returning to India on the understanding that Calcutta program begins on the 28th. From here of course I will go to Bombay as soon as our business here is settled up. Here in Nairobi our program is going on very nicely. There are TV engagements and a very large meeting is scheduled at the University of Nairobi for tomorrow. Many respectful Hindus are inviting us and I am staying in everyone's house for four to five days. Most probably our center here in Nairobi will be a strong one, as strong as any of our other centers. Two black devotees have come here today from N.Y. and Dinanatha should come here from there as soon as possible. The Africans locally are becoming very much interested and there is great field here in Africa for spreading Lord Caitanya's movement. Also the life membership program is going on very happily. Already we have collected more than 30,000 Kenya shillings. To follow this policy that the membership fees are not touched is very good. Other collections may be spent by you but don't spend extravagantly because we have got very heavy responsibility. Everything should be done very cautiously. And because we are a registered society, accounts must be submitted with proper regulative principles. Otherwise it may not be accepted. So far the books sent to Nepal, they should return the money for being deposited in the book and building fund or if they open an account there separately, then they should pay for the books, actual price, so that the accounts may be kept clearly. Please accept my blessings. I beg to aknowledge receipt of your letter dated 21st September, 1971 and have noted the contents. I have seen the copy of the letter from the department of State. So keep on trying, Krishna will help you. One thing is that Indira Gandhi, Prime Minister of India, is expected by the 3rd November in Washington D.C. so try to bring her to our temple and give her a nice feast, so that she can know what ISKCON is doing there in U.S.A. I am so glad to hear that there are many new devotees there and they are doing so nicely. All newcomers should be welcomed and well treated. In the beginning they may be treated leniently and gradually they will learn. So out of many thousands of people on comes to become Krishna Conscious. So it is our duty to help them as far as possible. that is one of our activities. Yes, this Govardhana puja is a bona fide procedure, but such things cannot be held in your country. It requires good space to decorate the imitation hill of rice. So when we offer such hill of rice, there must be other things also--a hill of capatis and other things. It is a huge affair. In India practically in all the Visnu temples this is observed and they spend huge amounts for this purpose and they distribute prasadam to thousands and everyone gathers to take even a little portion of it. If you can introduce this Govardhana puja, I have no objection, but it requires hard labor, good management and much money also. But the process is bona fide. Yes, the picture is bona fide. Whatever the Indian gentleman may say, that is up to him, but this picture is bona fide; it is called Bala Krishna. Please accept my blessings. Enclosed you will find one photograph of the Deities there in L.A. recently sent to me. Why is Krishna without a flute? What is the difficulty to make for Krishna a flute? You can take a twig and wrap it in golden lace with a pearl drop hanging. That is a flute; how long it takes to make? Nothing should be concocted; not that a flower in place of a flute. I think you have already advised N.Y. to send the full manuscript for Bhagavad-gita As It Is to Dai Nippon. If not you can advise them immediately. Enclosed also you will find one letter from Kunjabihari das Brahmacari. So four times he has left the society; that is not very good record. So he is asking for second initiation. Let him stick to L.A. temple under your care for at least six months and then he will be eligible. Piece of Govardhana Hill cannot be taken from Vrindaban. Please accept my blessings. I beg to acknowledge receipt of your pictures and note and it has so much engladdened me that I must admit that there is a little fraction of Caitanya Mahaprabhu's merciful glance upon you. You are alone doing such marvelous work and it is impossible for a person without being blessed by Krishna. So you should always be conscious of this special favor upon you and continue to work more vigorously to get more and more blessings of Lord Caitanya and his disciplic succession. Remain fixed up in your spiritual regulative principles. Chant not less than 16 rounds regularly and preach this cult of Krishna Consciousness to the Japanese people to the best of your knowledge and you will get more and more strength in the matter of preaching work. What happened to your wife and to Bhanu? So far registration is concerned, we have got our society registered in Kenya in three days. The procedure followed was: If you want to base the registration on the London constitution, you should write to London to get an original certified copy of the articles of association and articles of memorandum. You can write Dayananda in this regards. The thing is that the International Society for Krishna Consciousness was registered under the companies act with limited liability. The above mentioned articles of association and memorandum were presented here and were immediately accepted and the certificate of registration was given. So get our society immediately registered. Call men from U.S.A. or anywhere else and go on, vigorously preaching in the university campuses as you have sent me the photos. I think that place is the best for pushing on our Krishna Consciousness movement. We are doing very well here also and a big meeting in the university of Nairobi will be held on the 6th instant.